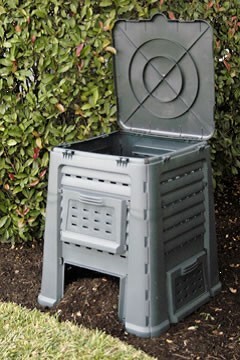 ThermoQuick® is latest in easy-to-use compost bins. Tuck it away in a corner of the garden and this discreet composter will perform its useful task of turning vegetables, fruit and garden waste into dark, rich garden compost. Thanks to the dark color and multiple well placed air slots, the ThermoQuick Compost Bin absorbs the sun’s heat and makes compost fast. The 5 panels of this compost bid are easy to assemble. The top lip opens straight up and stays up for easy loading and compost pile turning. Plus, there are handy removable access doors on all 4 sides. Lid grabbers on each side panel keep the lid from blowing open. With perfectly sized 110 gallon capacity, composting starts in your own backyard! Comes with a complete set of composting instructions. This entry was posted in Garden Plants on February 13, 2014 by admin.